The regional natural park of the Marais du Cotentin was created in 1991 and covers 150,000 hectares of the departments of Calvados and Manche in Basse Normandie, with 64,000 inhabitants in 143 communes. The park consists of an area of what used to be marshy ground covering virtually the whole access to the Cotentin peninsula. The only reliable route until the 19th century was via the higher, moorland, ground around Lessay, only 4 kilometres from the west coast of the peninsula. 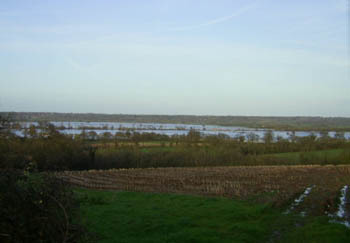 Much of the lower ground around Carentan was prone to frequent flooding by the sea until sea-defences were installed on the rivers such as the Vire. The area is today an important natural reserve of peat-bog and water-filled channels which provides a winter habitat for thousands of migrating birds and many rare species of other flora and fauna. Man's actions have to be carefully controlled in order to maintain the balance of this unique ecosystem, and it was in part due to this that the park was created.